My mom is a great cook. She has some really amazing classic staples in her repertoire: tender corned beef and cabbage, luscious chicken and dumplings, crispy fried chicken, fluffy pancakes. Yet I can count on both hands the number of times I’ve seen her in front of a stove. Despite her skills, cooking just didn’t interest her much. She was willing to do it on special occasions, but it was nothing that captured her attention on a regular basis. When my stepdad was in town, he stepped up to the plate in a big way, serving decadent meals like osso bucco or grilled steaks. But when he traveled for work, which was frequently, we kids fended for ourselves. There were a lot of Lean Cuisines in our lives. If Mom was feeling especially ambitious, she’d make real popcorn on the stovetop, and we’d have that for dinner with a bowl of ice cream. If my stepdad was gone for more than a few weeks, we started hanging out at the neighbor’s house around dinnertime casting longing glances at the broccoli. As a result, I continued to maintain a foraging mindset for years after I reached adulthood. I worked in restaurants, so most of my meals were eaten at work or consisted of takeout purchased with my employee discount. I rarely stepped foot in a grocery store: convenience stores served most of my nutritional needs. And getting married didn’t change my haphazard approach to meal-planning either. I managed a retail store and worked such random shifts that my husband and I rarely were home for meals at the same time. For years, I continued to be a major supporter of the frozen foods industry. The change in my attitude towards food came, at first, out of necessity. My husband and I could afford a diet of takeout and frozen dinners when we were living on two incomes. But when I lost my job during my pregnancy we had to cut corners everywhere, and our food budget got drastically slashed. I spent my days poring over grocery store fliers, clipping coupons, and browsing recipe sites. As a result, I had an invaluable crash course in learning how to cook. Little did I know, this skill would come in handy much later. As I’ve discussed here in the past, my daughter suffered from milk protein intolerance as an infant. We were able to correct her issues relatively quickly after her diagnosis thanks in large part to my newfound habit of cooking everything. Many prepackaged and processed foods have hidden dairy in them. Not only did my commitment to preparing our food made it easier for me to quickly eliminate dairy from my own diet while I was still nursing, by the time my daughter was ready to try solid foods I was a lot more confident in my ability to prepare tasty dairy-free meals. My trick? Instead of just adapting my regular recipe repertoire to be dairy-free I started experimenting with vegan cooking. Eating dairy-free versions of my favorite meals was a little depressing because they didn’t taste the way I remembered. Trying new vegan recipes helped me push the boundaries of my palate and explore my culinary adventurous side. I know what you’re thinking. There’s no way a stew made from peanut butter, kale, and canned pineapple could taste good. But it is incredibly delicious. It’s got the perfect flavor balance of sweet and savory, and the peanut butter sauce has a luscious creaminess you can often miss out on in dairy-free meals. Serve it over rice pilaf or couscous to make the meal more filling, and sprinkle roasted Spanish peanuts on top for an added textural contrast. Everyone in the family will love it: my now 17-month old eats it by the fistful. My kid is going through a clingy phase, which means it can be awfully difficult to get any cooking done when she’s around. This meal is great to prepare while she’s at preschool because it’s just as good cold as it is hot. Though I enjoy the nuttiness of quinoa my husband doesn’t love the texture, so I swap that out for Israeli couscous. I also sometimes trade in the dried cranberries for dried cherries for an extra burst of tart flavor. That’s the great thing about cooking! You can adjust recipes to your own personal taste. If you’re feeling especially ambitious, you can roast the chickpeas first, but be prepared: they’re such a tasty snack you may fill up on those long before dinnertime. They’re one of my daughter’s favorite salty snacks. My daughter isn’t super into vegetables on their own, but throw them into a spiced sauce and she’ll scarf them down like nobody’s business. 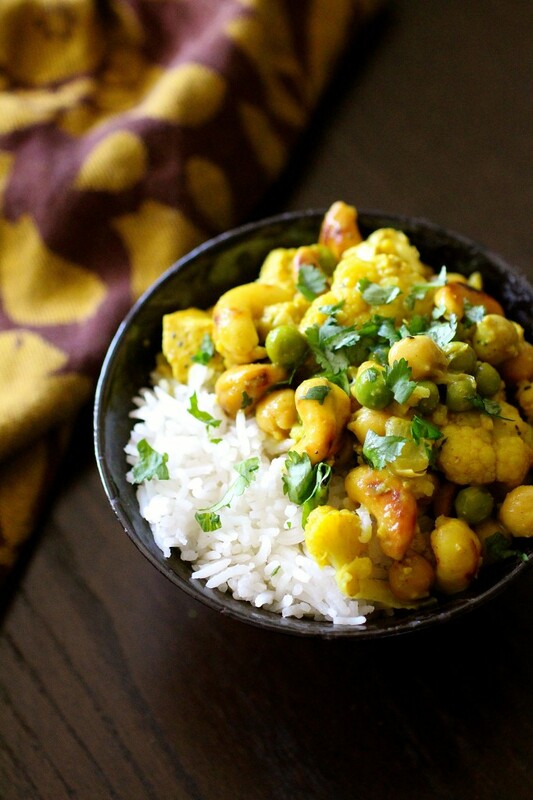 The sweet coconut milk is infused with a punch of flavor from curry powder, and it delicately infuses the cauliflower and peas with a subtle intensity. This meal is so crazy delicious that you’ll forget it’s vegetarian, much less vegan. I was born in Texas, so I love it when my meals have a little Tex-Mex kick. This tamale bean pie has a great blend of heat and sweet between the chili powder, cumin, and corn. You can definitely cut back on the spice factor if you’re feeding this to kids, but my daughter’s been eating this without batting an eye at the spice content since she was about a year old. The technique of using both creamy refried beans and whole pinto beans adds a heady richness to the dish. I would definitely double up on the crust ingredients, though: it’s thick and difficult to spread over top, so more is better for sure. There’s a common misconception that vegans cuisine is nothing but salads, but you can still have delectably indulgent fried foods on a dairy-free diet. These skillet-fried goodies are sweet and bready like little fritters. Serve them with a tomato and cucumber salad tossed with herbs and balsamic vinegar for a meal that is full of flavor. Whether you’re a novice cook or a mini-Martha Stewart, it can be daunting to adapt your cooking repertoire to dairy-free cooking for the milk protein intolerant members of your family. Hopefully these simple, nutritious recipes will help inspire you as you adapt to your new culinary challenges. You don’t have to sacrifice flavor to go to dairy-free: the proof is in the pudding with these delicious vegan recipes. Have some dairy-free recipes you’d like to share? Post links in the comment section! Kate Wight is a freelance writer and work-at-home mom to a daughter Eisley, who was born in October of 2011. Kate writes for a variety of clients on topics ranging from eco-friendly living to social justice issues to fashion when she’s not busy chasing after her very active toddler. You can read more of her work at the Bob Brown Art blog or in Edible Sarasota magazine. This entry was posted in feeding and tagged baby, dairy allergy, dairy sensitivity, dairy-free, feeding, food, milk protein intolerance, recipes, vegan. Bookmark the permalink. Candice Sandman is a Boston based mother of son Parker, a wife, marketing professional and owner of Field Logistics, LLC. Kate Wight is a freelance writer and work-at-home mom to a daughter Eisley, who was born in October of 2011. Kate writes for a variety of clients on topics ranging from eco-friendly living to social justice issues to fashion when she's not busy chasing after her very active toddler.You can read more of her work at the Bob Brown Art blog or in Edible Sarasota magazine.